Opt, Inc., one of Japan’s largest internet ads agency, Kazeniwa and Overtex launched a new advertising platform on influencers’ tweets, named Twad.jp (pronounced “Tsuado”) on May 24th. 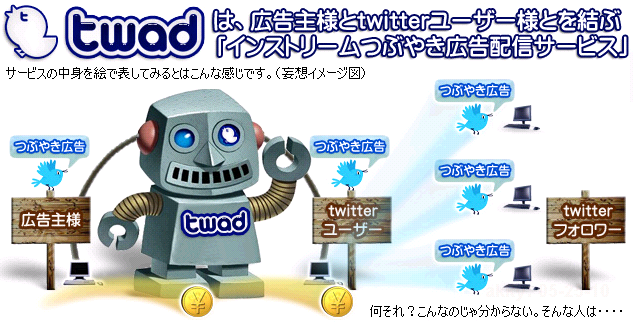 On Twad, Twitter user (publisher) can register their region, categories s/he regularly tweets, etc. and how much yen they want for single tweet from 100 to 74025 yen (US$1.1 to $818, according to ITMedia [J]). Then joined advertisers send a request with ad messages and time frame to tweet them. Twitter announced it would prohibit the third party’s ad tweet today. How will it affect the Opt’s new business? That robot looks a lot like Jobby’s old logo. Is it possible that they both use the same royalty free logo? As Jobby does not exist, it may be difficult to ask who made it.